COSCO Shipping Holdings said Thursday that it had eked out a profit attributable to equity holders of the company of 40.8 million Chinese yuan renminbi (RMB) or approximately $6 million in the first six months of this year compared with a profit of 1.86 billion RMB in the same period last year, a 98 percent drop. The decline in profit came despite an increase in revenue to about 45 billion RMB in the first half of this year compared to 43.5 billion RMB in the first half of 2017. The company's terminal business handled 2.8 million TEUs in the first half of 2018, 35 percent more than in first half of 2017. Revenue from the terminal business was up 67.5 percent to 3.18 billion RMB, while revenue from container shipping was up just 1.3 percent to 42.4 billion RMB. The company noted that in the first half of the year, demand for container transportation grew moderately and global cargo volume increased by 6.2 percent as compared to the same period of last year. COSCO itself achieved a shipping volume of 11,235,000 TEUs, representing an increase of 12.4 percent as compared to the same period of last year. The CCFI is based on contract rates. Like the more widely publicized Shanghai Containerized Freight Index, which is based on spot rates, it is produced by the Shanghai Shipping Exchange. “Meanwhile, surging bunker prices resulted in the increase of the cost of liner companies,” said COSCO. Looking forward to the second half of 2018, COSCO predicted the "world economy will remain on the path of recovery. Although trade protectionism is on the rise and Sino-US trade frictions may inhibit the growth of the global economy to a certain extent, it is expected that the global economy will continue its growth since 2017, thus providing guarantee for the growth of container shipping volume." 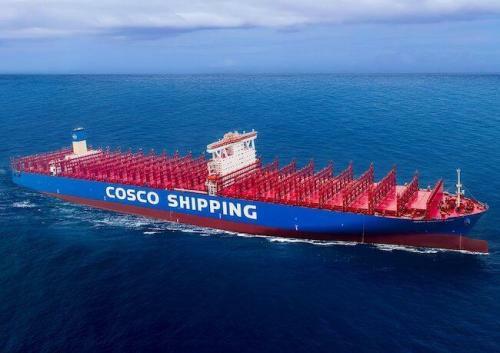 COSCO noted its acquisition of the parent company of Orient Overseas Container Line was completed at the end of the July and said COSCO "will soon open a new chapter of developing 'dual brands.' "
At the end of June, COSCO said its container fleet reached 393 vessels with carrying capacity of 2.04 million TEUs, 15.8 percent more than a year earlier. With the acquisition of OOCL and new ships on order, COSCO’s capacity now exceeds 3 million TEUs, which it says now makes it the third largest in the world, ahead of CMA CGM, and behind only Maersk and MSC.